Christmas 2013! The sun is just beginning to rise, and I can tell that it is going to be a beautiful, sunny day. It is 25 degrees right now, with a projected high of 45. Needless to say, there is no snow on the ground. All of that melted quickly, but then most of our Christmases are dry here in Denver. I think it snowed in the mountains yesterday–but not here. Oh well–maybe next year. Our celebrations with family have already taken place. We went to our son’s house on Monday (the 23rd) for a celebration there, where we saw some excited little girls who were thrilled with the dolls I gave them. Yesterday morning (Christmas Eve), we traveled to Littleton for a get-together with our daughter and her family. Traffic was very light as we headed down there, but really increased on our trip home. Then, last night we did something we haven’t done in years: we went to a Christmas Eve service at the little Presbyterian Church we plan to join sometime in January. It was like going home again, something Thomas Wolf once said you are unable to do. We joined this little church over 30 years ago when we first moved to Colorado and were members there a couple of years. Then we began exploring and probably traveled full circuit before finding ourselves at the port of origin. For Howard, it is like returning to his roots. We was born and raised a Presbyterian. I was raised a Baptist but became a Presbyterian when I married Howard. And since we are celebrating our 50th wedding anniversary in the spring, it’s like returning to my roots as well. The service was beautiful, culiminating in the holding of small candles at the end during the singing of “Silent Night.” After the service, we drove around town and looked at the lights before heading home. Now, it is Christmas morning, and all is quiet in the house. We are spending a peaceful day at home. I have planned our feast for later. We stopped at a super market on our way back from Littleton yesterday so I could get my annual grapefruit. I love grapefruit, but Howard doesn’t. And now experts are warning us we shouldn’t eat too many of them for whatever reason. I figure one grapefruit a year won’t harm me! In fact, I will really enjoy it. I don’t know whether we will watch a movie today, but we may find one later. So far, we’ve already seen “White Christmas”, “It’s a Wonderful Life”, and other favorites. Will wait until later and count that as a surprise. Sitting here now in the quiet of this early Christmas morning, I become keenly aware of the fact that the time of undecking is upon us–the time when I take down the tinsel, holly and bells and put them all away for another year! Undecking the halls is always as eventful as the decking of them, especially since I have increased the decorations over the last half century. Every year, I get something new in the way of decorations. The trick about undecking the halls entails putting all of this stuff away so I can retrieve it all without difficulty next year! No doubt I will begin the project inside the house and save the yard and front windows for last. It will take a week putting away all the interior items! 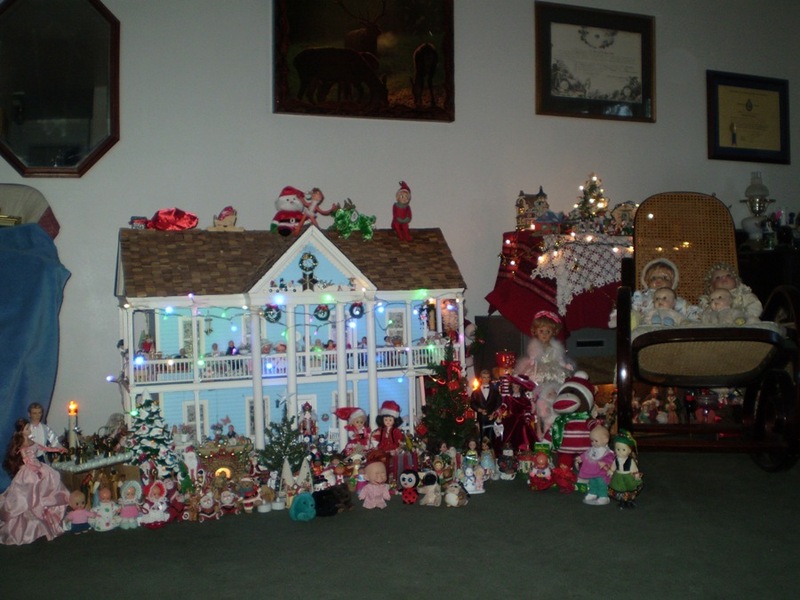 By saving the yard and windows for last, I will have some of my display through New Year’s Day. Actually, this display has become like an old friend since it has been up since early November. I will miss it when it is all boxed away. From our house to yours: have a very Merry Christmas 2013, and a wonderful New Year 2014. We wish the best for all of you.